A stunning and VERY unusual range of gifts created using fragments of genuine meteorites. They have been mainly made using iron meteorites- remnants of the cores of exploded planets that weren't meant to be. With Christmas coming - what could be a better gift for any fan of astronomy or just amazing objects!? One event these items are VERY popular is a 6th- Iron Wedding Anniversary. What could be a more unique iron gift for this anniversary than a real piece of iron meteorite! This is a super little item and a great stocking filler for Christmas or an iron wedding anniversary gift. A polished slice of the 'Campo Del Cielo' Iron meteorite has been encased forever in coloured resin. This is then mounted with a magnet so it will stick to any fridge and give you a guaranteed talking point. 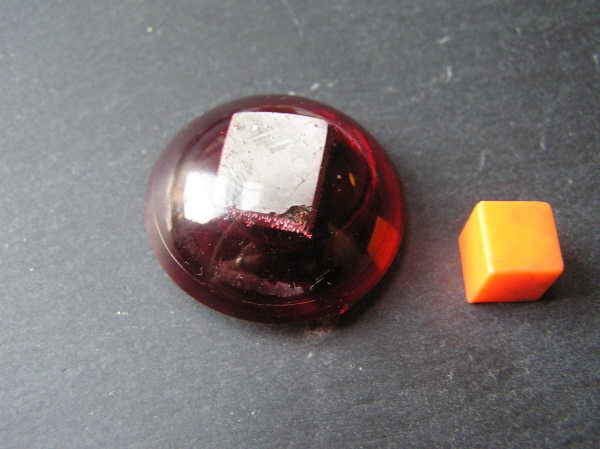 The resin setting measures 3.7cm across and is 1cm thick and the meteorite slice measures `1.5cm at its longest point. This is guaranteed to be a genuine meteorite - and comes nicely presented in a protective box along with a signed certificate. I will also send you an illustrated A4 meteorite information sheet. This is an ideal introduction to the amazing world of meteorite collecting and would make a GREAT gift for any astronomy or natural history fan! I have found these to be very popular to give as Iron Wedding anniversary gifts. I have sold loads over the last few years to people wanting to give something unusual to their spouses on their Iron Wedding Anniversary. It seems to be a more exciting a gift than a household iron! 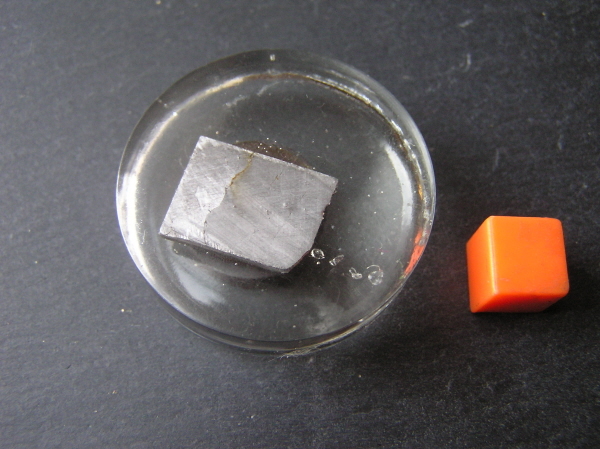 A fragment of genuine Campo Del Cielo iron meteorite has been skilfully encased in coloured resin. This both creates an attractive and intriguing object, and the resin offers the bonus of protecting the meteorite from the Earth's harsh atmosphere FOREVER! I offer a variety of different types of meteorite and the list below shows you the meteorite types and respective colours available. 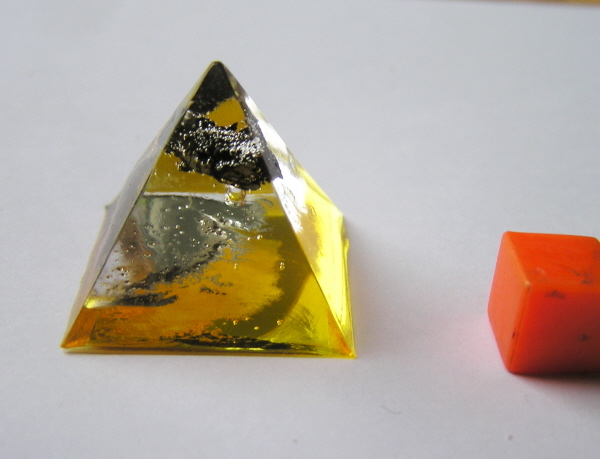 Each pyramid measures 2.5 x2cm and has an identifying label on the base. This is guaranteed to be a genuine meteorite - and comes nicely presented along with a signed certificate. We will also send you an illustrated A4 meteorite information sheet. This is an ideal introduction to the amazing world of meteorite collecting and would make a GREAT gift for any astronomy or natural history fan! 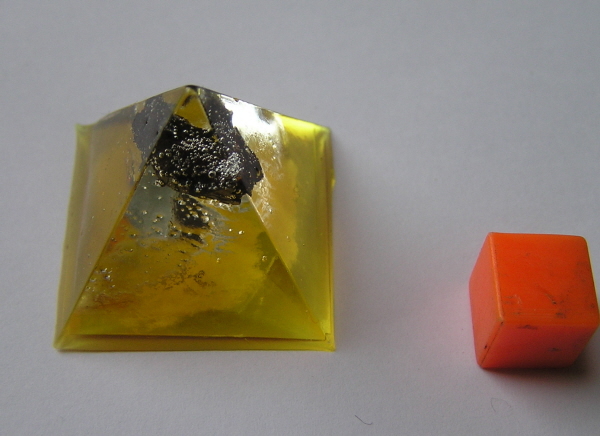 The resin setting measures 3.5cm across and is 1cm thick and the meteorite slice measures 2.5cm at its longest point. 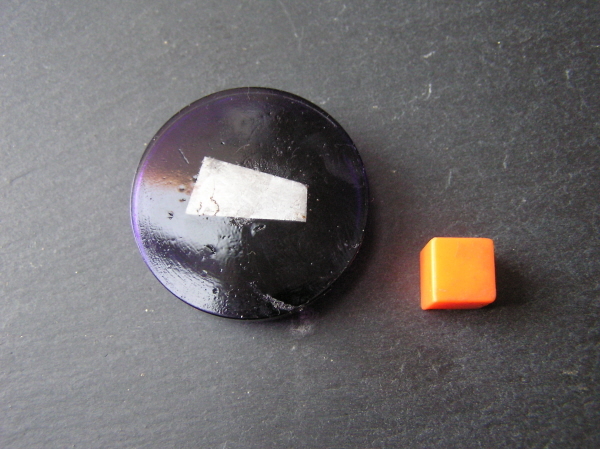 The resin setting measures 3.7cm across and is 1cm thick and the meteorite slice measures `2cm at its longest point. 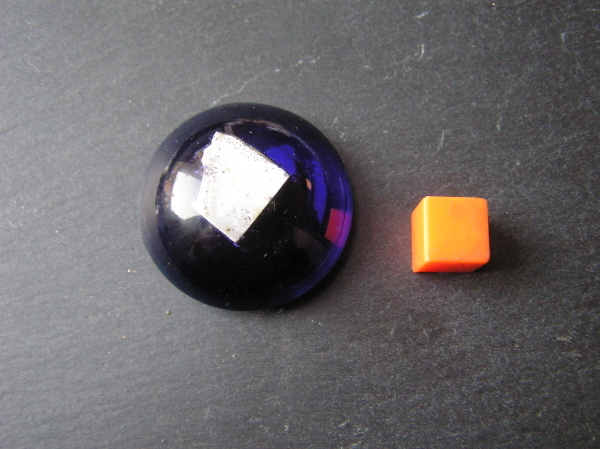 The resin setting measures 3cm across and is 1cm thick and the meteorite slice measures `1.5cm at its longest point. 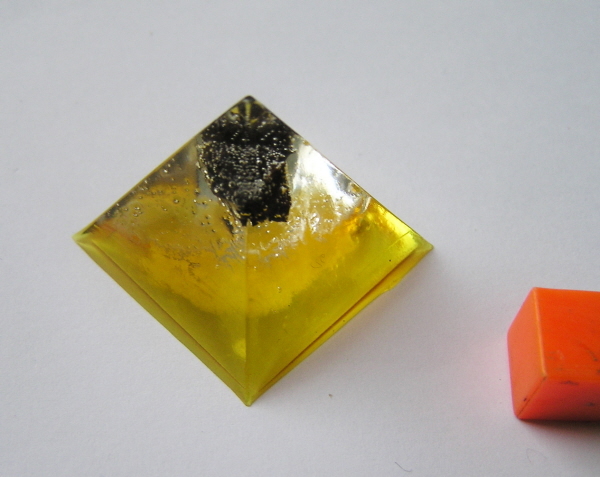 The resin setting measures 3cm across and is 1cm thick and the meteorite slice measures `1cm at its longest point. 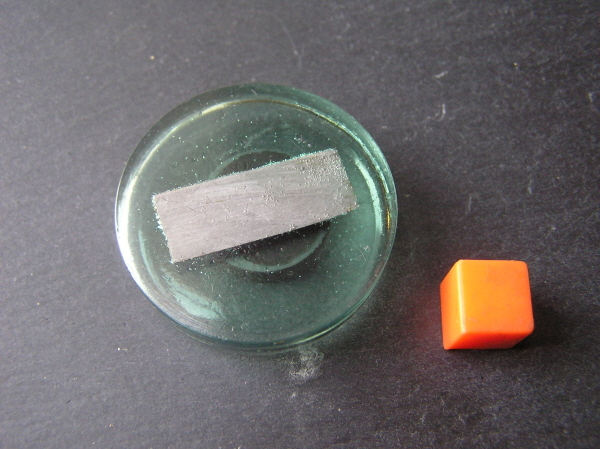 The resin setting measures 3cm across and is 1cm thick and the meteorite slice measures `1.1cm at its longest point. 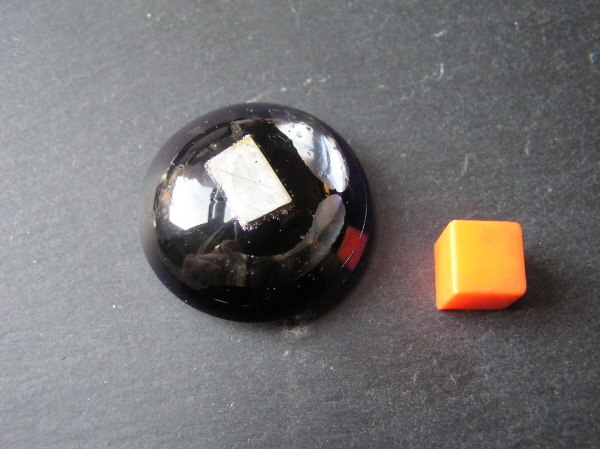 The resin setting measures 3.7cm across and is 1cm thick and the meteorite slice measures `1.4cm at its longest point. 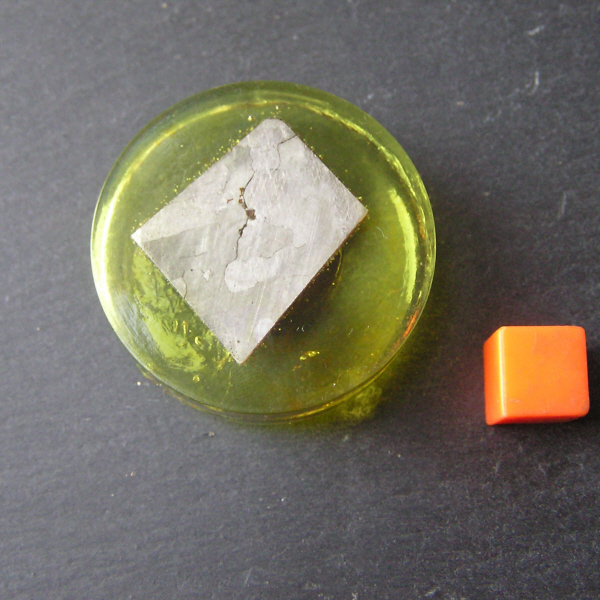 The resin setting measures 3.7cm across and is 1cm thick and the meteorite slice measures `1.8cm at its longest point. A polished slice of the 'Campo Del Cielo' Iron meteorite has been encased forever in clear resin. 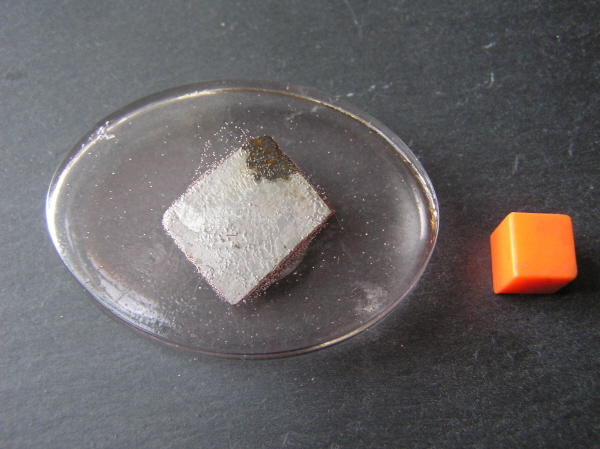 The resin setting measures 5.5cm across and is 1cm thick and the meteorite slice measures `2cm at its longest point. 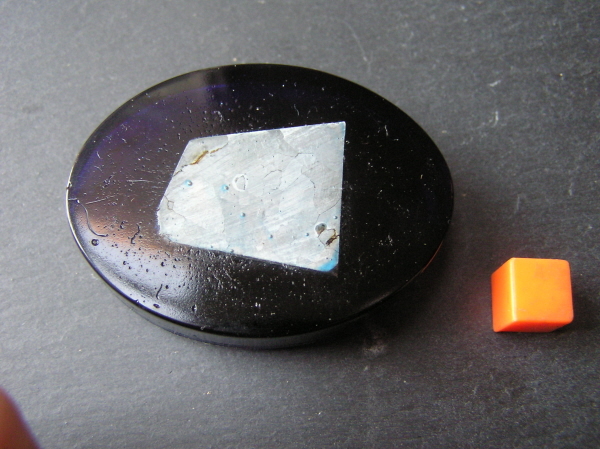 The resin setting measures 5.5cm across and is 1cm thick and the meteorite slice measures `2.5cm at its longest point.